Do it right the first time so you can get back to living life. Use sufficient doses … 0.8g/kg to 1.5g/kg (usually 1.2g/kg for end target). The higher doses necessary for the more virulent or later stage cancers. Use the least oxidized IVC solutions. If using commercial solutions, these should be ordered as fresh and administered as soon as possible from the date the solution was manufactured. Manufacturers presumably engage in deoxygenating processes in order to lengthen the shelf-life and maintain the reduced nature of the solution, but none of that is required nor validated. For highest confidence, the solution should be compounded from fresh sodium ascorbate powder then used within 1-2 hours, although this is very rarely done today. Patients should ask how old the solution is and request to have the most recent solution the clinic has on hand. If they dig it out from some old inventory, don’t expect stellar results. It should be administered at least 2x weekly, preferably 3x weekly. In this one case, more is always better. Test strips can be used to determine when and if the patient is dropping to scurvy levels between administrations. Start the treatment as early as possible. 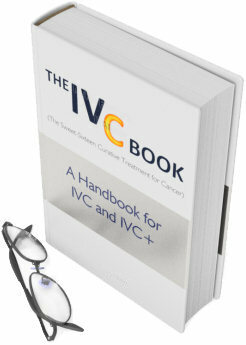 Start it when conventional cancer care normally starts (usually stage 1 – stage 3). The earlier, the better. Reserving this treatment for cancer patients exclusively at stage 4 for whom conventional cancer care has failed is not fair for the patient, neither is that a fair test of the protocol. Engage in a moderate exercise regimen enough to get the heart pumping to a safe but high level for 15-30 min per day, but especially on the day of the infusion, even during the infusion if possible (which many patients can do if the hospital has an exercise bike). See http://www.cancerfoundationforlife.org/for ideas on how you can facilitate this when the hospital or clinic is not easily set up to do this. Any exercise program should be under the observation of a licensed practitioner. Patient should not exercise if feeling faint (which is different than fatigue or tiredness). If in an upright position where falling is possible, have a spotter at least for the first time, and always for some patients. Err on the side of safety. If exercising during IVC, patients should rest when getting tired, for 5-20 minutes at a time, so long as the heart rate can remain somewhat elevated. The idea is only to significantly increase heart rate. Other oxygenation possibilities: Alkalinizing foods (that are low-GI) like colorful vegetables, Deep breathing exercises, Supplemental oxygen, Hyperbaric oxygen, and UVBI. There are a number of body oxygenating supplements that can also assist. Engage in a slow carb / med-low carb diet (especially during IVC administration). This will deplete the stores of energy for cancer to survive. High glycemic foods are often the other thing to blame when IVC doesn’t seem to work (in addition to the hypoxia in and around tumors). Many studies have been done where they give soda and sweets to patients during the treatment … which rescues cancer from the treatment. This practice as recommended by doctors seems almost insidious. There are a dozen studies that demonstrate the IVC kills cancer by starving it to death of energy (the-succeed-against-cancer-protocol). High glycemic foods short-circuit that process and render it ineffective. During or right after administration a low gi food like a banana or avocado or similar is okay, but no more than necessary. The diet should remain low-moderate gi during the off-days when doing IVC as well. Don’t shun other beneficial conventional cancer treatments. The overwhelming preponderance of studies demonstrate a synergistic effect with conventional oncology where the product of the integration is greater than the sum of their individual parts.